This recipe is for my friends Matt and Scott. Matt asked me a few months ago if I had a good recipe for venison. Sadly, I didn’t, as I’ve never cooked with venison meat. Shortly after my good friend Scott sent me home from a BBQ with ground venison from his hunting expeditions. What are the odds? There are two variations: a green sauce with goat cheese and a New Mexico red sauce with chocolate and cinnamon. The green sauce was a complete cheat job as I doctored up a can on Goya green enchilada sauce. The red sauce is a culmination of many recipes I researched and many adjustments made when cooking the sauce. I also snuck in some spinach and cremini mushrooms into the filling… I had them on hand and I’m always looking for a way to sneak in some veggies where they are unexpected. Served with my favorite cabbage slaw. Put leftover enchilada sauce in the freezer… I see a Tortilla Soup coming from my leftovers soon. Heat oil in a large heavy. Add venison meat, chopped onion and chopped garlic, season with salt and pepper and brown the meat, stirring occasionally. Add mushrooms and spinach and cook for 3-4 minutes until mushrooms are brown. Add chili powder and cilantro. Deglaze this with the chicken stock. Removed from heat and allow to cool. In a medium saucepan heat oil, add flour, smoothing and stirring with a wooden spoon. Cook for 1 minute. Add chili powder, tomato paste, onion and cook for a minute. Add stock, tomato sauce, oregano, cumin, cinnamon, cocoa powder, and chocolate. Stir to combine. Bring to a boil, reduce heat to low and cook for 15 minutes. The sauce will thicken and smooth out. Adjust the seasonings. In a medium saucepan heat 1 tsp canola oil, add onion, garlic and cumin. Cook for 3-4 minutes until onions are translucent. Add Goya enchilada sauce and cilantro. Stir to combine. Cook for 5 minutes. Soften corn tortillas in a microwave oven, wrapped in a damp cloth for 20 seconds on high, until soft and pliable. Spoon 2 to 3 tablespoons of venison mix into center of tortilla and top with cheese and roll. Place rolled enchiladas into a lightly oiled baking dish, seam side down. 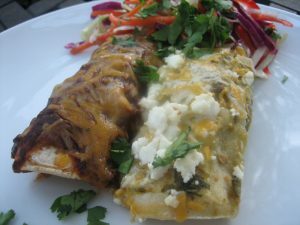 For Green Enchiladas: Smother with green enchilada sauce and sprinkle with colby-jack cheese and goat cheese crumbles. For Red Enchiladas: Smother with red enchilada sauce and sprinkle with colby-jack cheese.